The Mobile Computing Wars: Google Is Killing Them! Android, led by Samsung, is far and away the growth leader in smartphone sales. With nearly 99 million units sold, Android devices captured 64% of the smartphone market for the quarter (compared to 43.4% a year ago, and nearly 0% in 2007). Samsung’s Galaxy line of devices accounted for more than half of all Android sales, reaching 45.6 million devices sold. The new Galaxy S3 sold 10 million units in its first two months of its release. “The Galaxy S3 was the best-selling Android product in the quarter and could have been higher but for product shortages,” Gartner notes. Apple’s iOS-based iPhone devices saw growth as well at almost 29 million units, but this was only in line with overall smartphone market expansion, causing market share to remain static. The platform captured 18.8% of the smartphone market (versus 18.2% the year before). Gartner notes that sales of the iPhone fell. Apple was named the best-selling U.S. handset brand during the fourth quarter, according to a new report from the NPD Group. 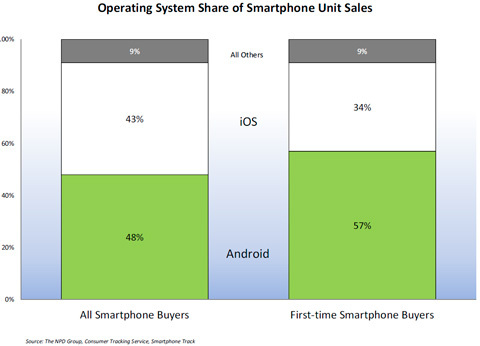 However, the findings suggest that while iOS has won this battle, Android is really winning the war. Not only do 48 percent of all smartphone buyers own Android smartphones (versus a close 43 percent on iOS), there is a much bigger disparity for first-time smartphone buyers. Android is attracting more than half of them at 57 percent, while Apple is considerably behind at 34 percent. RESTON, VA, February 2, 2012 – comScore, Inc. (NASDAQ: SCOR), a leader in measuring the digital world, today released data from the comScore MobiLens service, reporting key trends in the U.S. mobile phone industry during the three month average period ending December 2011. The study surveyed more than 30,000 U.S. mobile subscribers and found Samsung to be the top handset manufacturer overall with 25.3 percent market share. Google Android strengthened its lead in the smartphone market to reach 47.3 percent market share. Covering the three-month period ending December 31, Samsung remained constant without any changes in its portion of the market share — likely because the anticipated Galaxy Nexus did not make a debut on shelves until nearly the end of the quarter. The only mobile OEM to post an increase was Apple, which ranked fourth with 12.4 percent of the market share and a 2.2 percent point change. Putting this in perspective allows one to see just how far Android has shot ahead in such a short amount of time. Last quarter was Apple’s biggest quarter ever for a variety of reasons that are the result of the confluence of a swath of unrepeatable factors. Despite such an outrageous quarter that likely will never be repeated, Apple still has less than than half the market share of Samsung, its largest vendor (we aren’t talking Google’s Android here, we’re talking Apple’s own [other] vendor, Samsung). This is relevant for a variety of reasons. For one Samsung’s tech is vastly superior to that of Apple’s. Marketing and fanboisms aside, practically any objective review agrees with this assertions. We did a head to head comparison of the iPhone 4GS and the Samsung Galaxy 2S during the last BoomBustBlog meet and greet. For those who weren’t there, simple peruse YouTube for the many professional comparisons to be found. You see, the cool thing about YouTube is that you can interact with the TV audience. There are nearly a million views of their comparison with nearly 3,300 likes/dislikes and 5,000 comments. I invite one and all to go through them cursorily to determine what the actual populace (not the slanted media or Apple’s marketing department) feels about the phones, and more importantly, what their next phone will be. As for Android, there’s no stopping it anytime soon. The platform now covers 47.3 percent of the U.S. mobile market share. Again, in the top five only Apple saw a surge in its cut as iOS placed second with 29.6 percent. According to a leaked screengrab hosted up at MacRumors, Apple retail shops now have the authority to price match carrier and rival retail discounts on iPhone. Specifically, the note informs employees that prices from Best Buy, “carriers,” Radio Shack and Target can be matched, with $49.01 seeming to be the savings across the board. Curiously, places like Wirefly, Amazon, Negri Electronics and even Walmart aren’t mentioned, so we wouldn’t recommend trying to work the price down based on ads seen from any of those. Price matching big box retailers clearly shows the luxury, premium aura of the iPhone to be at the end of its cycle. The Mobile Computing Wars Are At The Half Time Mark and Google Is Killing Them! Where Are The Pundits And Armchair Analysts When It Becomes Apparent That Apples Is Indeed Susceptible To Google’s Android Onslaught? The Only, and I Mean the Only, Investment/Research House To Warn Of An Apple Miss Is Vindicated!!! Sliced Apple Margins For Dinner?